Betsy Khol, first-year industrial engineering major, with Buster, RIT's first-ever service dog in training, in the Student Alumni Union last March. A university such as RIT is home to an eclectic mix of students—all shapes, sizes, colors and interests. But one particular “student” who spent part of the past year on campus stood apart from the rest. Meet Buster, a 20-month-old black Labrador retriever, and his best friend, Betsy Khol, a first-year industrial engineering major from Vienna, Va.
Buster, a service dog in training, lived with Khol in Peterson Hall and accompanied her everywhere during portions of winter and spring quarters as part of a pilot program established this year. Working dogs are not plentiful at RIT, but neither are they unheard of (one other RIT student kept a service dog this year). As RIT’s first-ever guide dog in training, however, Buster raised an interesting question: Would he be allowed to share part of Khol’s freshman year on campus? But because no one had previously requested bringing a service dog in training to live on campus, Khol faced some initial obstacles. However, with assistance from Mary-Beth Cooper, vice president for student affairs, the pilot program was created and Buster was welcomed to campus as a full-time resident—with agreed-upon restrictions—in January. “Dr. Cooper was very, very supportive,” says Khol, who has trained service dogs since she was 13 years old (Buster is her fifth trainee). Walking across campus, Khol and Buster—he’s attired in a blue “jacket” marked “Guiding Eyes for the Blind”—catch the attention of nearly every passerby (most of them smile). Khol’s dorm mates—including roommate Kylie Rhoades, a first-year general science exploration major—enjoyed having Buster around and many regularly stopped by just to say hello. Inside dining halls, Buster blended in while resting inconspicuously beneath Khol’s chair. How could he muster the courage to ignore the food and the smells? “He has no issues. He knows the food is not his, so he just leaves it alone, stays with me,” Khol says. Except, that is, for University Physics 1 class—Buster’s favorite. Recalls Batcheldor: “At first, I was a little apprehensive at having a dog in the classroom. However, there is always the possibility that a student will require the services of a dog in the future, so I was interested to see how such a situation would work. 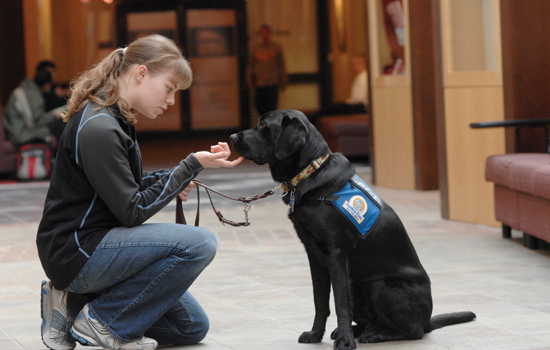 Khol’s interest in raising service dogs was sparked when, as a teenager, she attended a Girl Scouts summer camp presentation by Patricia Burlin Kennedy, author of Through Otis’ Eyes: Lessons from a Guide Dog Puppy. She received her first puppy, Benny, in 2003. Labradors are particularly well suited for the work, Khol says. Khol’s mother, Michele, is coordinator for the Dominion Region of Guiding Eyes for the Blind, and her younger brother, Curtis, a high school senior, also raises service dogs. By mid-March, it was time for Khol to bid Buster goodbye. He was headed for eight months of harness training at Guiding Eyes for the Blind’s main headquarters, in Yorktown Heights, N.Y., before being placed, at no charge, with a blind or visually impaired person. “How can you give up the dog?” is a question Khol answers repeatedly. “The first one was the hardest and it gets easier after that,” she says. While parting, she admits, is difficult, it’s made easier by meeting the people who will be helped, hearing their stories and learning how grateful they are for their independence—made possible only with the help of service dogs. Buster’s “successor” is already part of the family. Six-month-old Faraday, currently with Khol’s mother, will join her this fall at RIT.